ISLAMABAD — Afghanistan’s Taliban confirmed to VOA Tuesday it has been holding a Canadian man, his American wife and their two children hostage, saying the insurgent group is waiting for the U.S. and Canadian governments to meet its demands. Joshua Boyle and his wife Caitlan Coleman, in a video that surfaced this week, called on Canada and the United States to pressure the Afghan government into halting executions of Taliban prisoners. They warned their captors will kill them and their children unless the demands are met. The insurgents took the couple hostage in Afghanistan in 2012 and Coleman revealed to her family through a letter that she gave birth to two children in captivity. “I know this must be very terrifying and horrifying for my family to hear that these men are willing to go to these lengths, but they are,” Coleman, wearing a black headscarf, said in the video. Zabihullah Mujahid, the main spokesman for the Taliban, told VOA on Tuesday the insurgent group has not released the video officially because it is not new. He added the video was recorded sometime back and was shared with the families of the hostages and also sent to their respective governments. “Both the prisoners are in good health. They have two children and there are no concerns about their health and safety,” Mujahid said. “Our demands have already been sent to the two countries and we have long told them (the hostages) that their countries must do everything possible to secure their freedom,” added the Taliban spokesman without going into further details. The United States said Tuesday it was still examining the video. “We remain concerned, obviously, about the welfare of Caitlan and her family, and we continue to urge for their immediate release on humanitarian grounds,” State Department spokesman John Kirby said at the daily briefing in Washington. A website called Site Intelligence Group (SITE), which monitors extremist activity online, posted the video Tuesday. Officials in Canada have said they are aware of the video but declined to discuss further details, cautioning it might risk endangering the safety of Canadian citizens abroad. 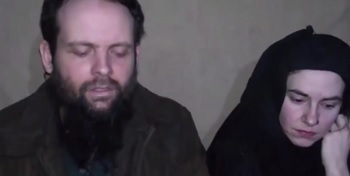 A video message of the couple first surfaced in 2013 asking the U.S. government to free them from Taliban captivity.